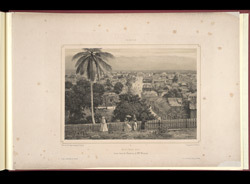 View of the town of Montego Bay, taken from 'Daguerian Excursions in Jamaica,' by Adolphe Duperly. Montego Bay was the capital of the parish of St James and the second largest port in Jamaica (after Kingston). The Melhados were a wealthy family from London; they owned a large house in Kingston in addition to an estate in Montego Bay.